Andre Ooijer and Arjen Robben scored to earn the Netherlands a 2-0 home victory over Norway and maintain their perfect record in World Cup qualifying Group Nine on Wednesday. The Dutch, who booked their place in next year’s finals on Saturday, went close to opening the scoring in the first minute and had to wait till the 33rd before Ooijer nodded in a free kick from Rafael van der Vaart. Norway’s only chance came just after halftime but Maarten Stekelenburg saved a shot from Morten Gamst Pedersen and a minute later Robben settled the match with a tight angled shot after good work from Van der Vaart and Robin van Persie. The Dutch top the group with 21 points from seven matches. Scotland are second with seven from five and Norway stayed bottom with three points. “When you consider our opponents were battling for their last chance and we only gave away one chance, and kept our concentration until the end, we did very well today,” said Dutch coach Bert van Marwijk. QUITO, Ecuador (AP)—Diego Maradona isn’t worried. Argentina has lost two of its last three World Cup qualifiers, but the coach is confident his team will advance to next year’s World Cup. Carlos Tevez failed to convert a penalty kick in the 29th minute for the two-time champions. Ecuador’s Walter Ayovi then beat goalkeeper Mariano Andujar in the 72nd minute and Pablo Palacios scored in the 84th. Tevez, a Manchester United star who paired up front with Barcelona’s Lionel Messi, had a chance to put the Albiceleste ahead early, but his penalty kick was blocked by goalkeeper Marcelo Elizaga, who was born in Argentina. 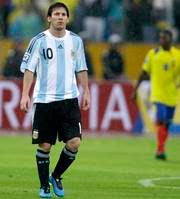 Quito’s 9,300-feet altitude appeared to bother Argentina, just as the 12,000-foot altitude in La Paz did during a 6-1 loss at Bolivia in April. Argentina (6-4-4), which hosts Brazil in its next qualifier on Sept. 5, is fourth in South America with 22 points, trailing Brazil and Paraguay (24 each) and Chile (23) going into games later Wednesday. Ecuador (5-4-5) was fifth with 20. “We have picked up two important victories in the last few days to keep up our hopes of reaching the World Cup,” Ecuador coach Sixto Vizuete said. The top four South American teams qualify for next year’s World Cup, and the No. 5 team goes to a playoff against the fourth-place team from North and Central America and the Caribbean.